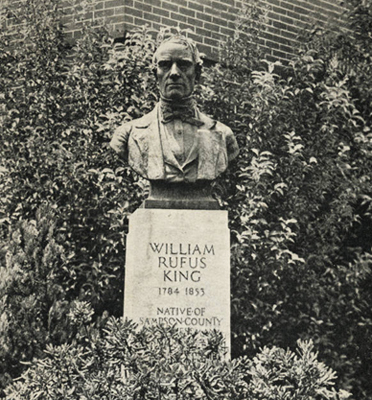 Cast in 1930, the monument commemorates William Rufus King. The bronze bust measures approximately 3 feet and 1 inch by 2 feet and 3 inches by 1 foot and 7 inches. Its granite base measures approximately 5 feet and 9 inches by 2 feet by 2 feet. William Rufus King was born in Sampson County, North Carolina in 1786. Throughout his long and successful career as a politician, the Sampson native worked as a lawyer, a member of the U.S. House of Representatives, Senator, Minister to France, and Vice President of the United States. Unfortunately, King's role as Vice President was short lived as he died just weeks after his inauguration. Within Clinton, attorney Captain Fitzburgh Whitfield sought for many years to have the memory of King honored by his fellow Sampsonians and Clintonians. The monument is located in front of the Sampson County Courthouse centered in front of the two stairways leading into the courthouse. The bust faces northwest towards Vance Street. The monument is surrounded by foliage as well as the stone, brick, and metal of the stairways nearby.